Does Chai Tea Contain Caffeine? Is Blueberry Tea Good for You? Chai can be caffeinated or decaffeinated, although the more-common caffeinated version of the drink is traditional. This sweet tea-based beverage is an Indian tradition that has gained popularity in the West in recent years. Caffeine in chai can have both benefits and dangers to your health -- check with your doctor if you are concerned about your caffeine consumption through chai. Chai is simply the word for "tea" in Sanskrit and Hindi. The chai tradition developed in India some 2,500 years ago as a result of trade with China. Chai now refers specifically to a spiced tea that is sweetened and mixed with milk in the Indian tradition. 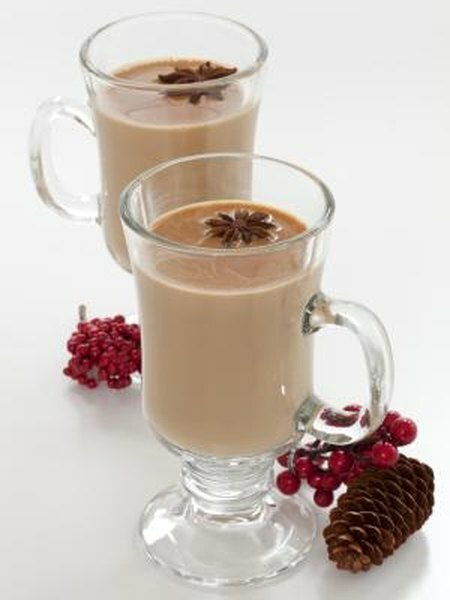 In Western countries, chai is available as a spiced black tea that is then prepared with milk. Major cafe chains now offer "chai lattes," so-called because of its high milk content. The caffeine content of chai depends on the type of tea used in preparation. Green or black tea varieties can be used in the preparation of chai, and using a decaffeinated tea as the basis of the chai will result in a beverage with minimal caffeine content. The caffeine content of 240 milliliters -- 8 ounces -- of regular black tea is between 40 and 120 milligrams. Decaffeinated black tea has between 2 and 10 milligrams of caffeine in every 8 ounce or 240 milliliters. Therefore, the caffeine content of the average chai is a little lower than the average black tea because the milk in chai dilutes the tea. The black or green tea typically used to make chai can be mixed with different sweeteners, milks, and spices. Dairy milk is most commonly used, but chai can also be made with soy milk or rice milk. Sugar, honey or artificial sweeteners may be added to the chai. Some of the spices typically present in chai include cardamom, cinnamon, cloves, pepper and ginger. Although excessive caffeine consumption is generally considered detrimental to health, the caffeine in chai can have several health benefits in moderation. Because caffeine is a stimulant, caffeine consumption can temporarily boost energy and fight fatigue. Recently, it has been indicated that caffeine may be beneficial for patients with Parkinson's disease. In 2010, the "Journal of Alzheimer's Disease" reported that caffeine can protect against neuron degeneration, thereby delaying the onset and progression of Parkinson's disease. Too much caffeine can be dangerous. Because it is a stimulant, caffeine can cause insomnia, nervousness, shakiness, headaches and heart palpitations. According to a letter published in the journal "Psychopharmacology," caffeine can lower a person's seizure threshhold. If you are prone to seizures or suffer from epilepsy, overconsumption of caffeine may cause you to have more seizures. The Mayo Clinic recommends the average adult should limit caffeine intake to no more than 500 or 600 mg per day. What Are the Benefits of Dandelion Root Tea? What Are the Benefits of Licorice Tea?